Let us start with the basic working of a standard solar cell and how it converts solar radiation into electricity. A typical solar cell is a silicon p-n junction diode, thus having a depletion region. In the absence of light, the cell behaves similar to a diode. When light contacts the cell, the photons are absorbed by the silicon and photon energy is transferred to the electrons. This extra energy excites the electrons and they transition from the valence band to the conduction band, where they are free to move. These excited electrons are called “free carriers”. The electron transition creates a corresponding vacancy called a “hole”. A potential is created across the depletion region as a result of recombination to form neutral atoms there. Metal contacts connected to the p and n regions give these electrons a flow path—an external circuit—to move across this potential and recombine with the holes. This motion of electrons creates an electric current and the cell functions as a battery. 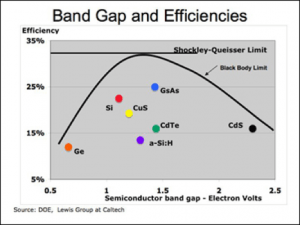 Figure 1: Shockley -Queisser Limit for Different Photovoltaic Materials (source: DoE Lewis Group at Caltech. We will assume both the sun and solar cell to be black bodies, and the complete solar energy to be incident on the surface of the cell at a normal angle. We will also assume that Carnot work is extracted from the cell by a heat engine. For the sun’s temperature at 5760K and ambient temperature of 300K, we get a maximum of 85% efficiency at cell temperature of 2470K. In this limit, we consider that all photons are absorbed, there is no thermal dissipation and maximum work is extracted from each photon. The main assumptions of the SQ limit is that the semiconductor cell is of one material, having one p-n junction. It assumes that all incident photons having energy higher than the band gap produce one electron-hole pair per photon. All excess energy of the photon is converted to heat. What we find is that about 47% incident energy is lost as heat, 18% is not converted and passes through the cell, 2% is lost in recombination effect, and the remaining 33% is converted into electricity. Therefore, the theoretical SQ limit of a silicon solar cell is 33%. This number does not consider losses due to optical arrangements and manufacturing defects. The SQ limit assumes that one sun of solar radiation (unconcentrated) is incident on the cell. This means that the incident photon flux density is very low and can easily be increased by 500 times by inexpensive optics. In Figure 2 it can be observed that visible wavelengths from 400nm to 800nm have the maximum energy. These wavelengths are ideal for the generation of photocurrent. For a semiconductor electron to move into an external load circuit, its energy level must be increased from its normal valence level to its higher energy conduction level. The amount of energy required to boost it to the higher level is known as the band gap energy. All photons having energy higher than the band gap energy can produce a carrier electron which produces electric current. However, only the band gap energy is used to excite the electron; the rest is converted to heat. 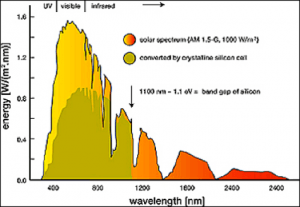 The band gap of the crystalline Si solar cell is at 1064 nm which is within the near infrared region of the solar spectrum. Hence the higher energy visible region of the solar spectrum converts into heat, increasing the dark currents and reducing the energy output of the solar cell. Tandem solar cells use different solar cells in tandem to absorb more of the solar spectrum. A typical tandem cell is shown in Figure 3. The tandem cell consists of three main cells, each separated by a tunnel junction. The tunnel junction allows free electron movement but keeps the electric fields of each cell separate from one another. 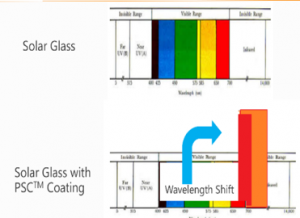 Each cell absorbs a different wavelength range due to its band gap and converts that specific portion of the spectrum. Performing a calculation using the SQ methodology, a two-layer cell can reach a maximum theoretical efficiency of 42%, and three-layer cells 49%. However, tandem cells are very expensive. In addition to cost, there are other issues that make tandem cells prohibitively complex. Another way to increase solar efficiency has been the use of concentrated photovoltaics through which sunlight is focused onto a small solar cell by lenses to generate more power per unit of surface area. The main appeal of such concentration is that it can convert “one sun” cell electricity production to a much larger scale using relatively simple and inexpensive optical enhancements. For example, the Fresnel lens incorporates circular facets to focus sunlight onto the surface of the cell. This technique reduces the land area per watt of power generated. Limitations include expensive peripheral materials such as helio-tracking devices, concentrating lenses, and cooling systems. There are numerous projects under the name of concentrated photovoltaics (CPV). In a regular solar cell, each photon collision generates a particle pair consisting of one free hole and one free electron. 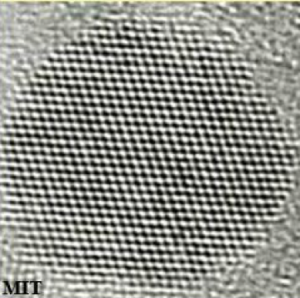 Quantum dots are nanocrystals interspersed in a larger semiconducting material. When photons with energy greater than the band gap energy collide with a quantum dot, several “hot” hole/electron pairs can be created as opposed to just one pair and excess heat. Another characteristic of quantum dots is that varied sizes capture different wavelengths of light. Researchers have discovered ways to stack the dots from small to large to capture more photon energy, like tandem cells. Once a hot electron is created inside a quantum dot, its lifetime is extended as much as 1000 time before it cools. However, the electrons prefer to stay inside the quantum dot. One of the challenges was to figure out how to extract the hot electrons from the quantum dots. Quantum dots have produced cells with quantum efficiencies close to 100%. The extra electrons come from the extra energy that remains after the initial photon-electron collisions. The solar spectrum is broad (300 nm to 2400 nm) in comparison with the band-gap of the p-n junction forming a solar cell (600 nm to 1064 nm). A groundbreaking invention called Photonic Solar Conversion (PSC) uses nano-optical layers with nanoparticles to downshift the UV and visible part of the spectrum, leading to enhanced external quantum efficiency (EQE) without any modification to the current solar panel manufacturing process. PSC has the potential to transform the marketplace of the solar industry by reducing the Levelized Cost of Energy (LCOE) over the life span of a solar panel. The management of the solar spectrum via photoluminescent down-conversion layer (PDL) using quantum dots and lanthanide ions is well documented. In principle, the down-conversion takes place because of the resonant transfer of one high energy photon to two or more lower energy photons causing an external quantum efficiency of more than 100%. For example, in lanthanide ion layers which have a praseodymium Pr3+ in yttrium fluoride YF3 host, a photon with high energy at 185 nm wavelength is absorbed first in the lanthanide ion and then down converted into two low energy photons of 408 nm and 620 nm. The process is achieved in two steps: 1S0 à 3P1 at 408 nm and then a second conversion 3P1 à 3F2 at 620 nm. This process of down-shifting high energy photons to numerous low energy photons increases the probability of creating more than one electron per photon, which increases external quantum efficiency (EQE) ≥ 100%. Down-conversion has enormous potential to increase the efficiency of the silicon solar cells beyond the Shockley-Quiesser limit of 33%4, and the technology for downshifting with nanoparticle and quantum dots has shown significant promise. Dr. Nishikant Sonwalkar has conducted significant research in Photonic Solar Conversion (PSC) and demonstrated the efficacy of nano-optical coating that can achieve an increase in solar cell efficiency because of solar spectrum management. The new frontiers in solar photovoltaic power generation lie in concentrated solar radiation with high efficiency and small form factor. This requires change in the fundamental process of the generation of solar photovoltaic cells that can exceed the limitations of the SQ barrier, as well as the further development of insolation and band gap engineering for high performance at elevated temperatures. Quantum dot research is crucial to exceeding the current limitations of solar photovoltaic power generation. Current research is focused on the quantum dot enhanced GaAs direct band gap solar cells that can reach close to 100% quantum efficiencies. Although the current research thrust is in band gap engineering using quantum dot methodology to exceed the current limitations of the solar cell, the photonic solar conversion process shows significant promise for large scale improvement of solar panels. 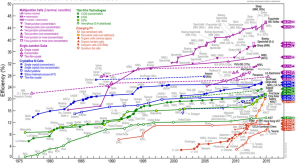 The Figure 6 shows the growth in the efficiency of PV solar cells over the last 40 years. Dr. Sonwalkar would like to acknowledge the University of Massachusetts Boston’s Venture Development Center for facilities and Naikaj Pandya serving as the co-op student on the solar project. Thanks are also due to Swamini Shah and Michael Maloney for their editorial contributions to this technical brief. Chuang, Chia-Hao M.; Brown, Patrick R.; Bulović, Vladimir; Bawendi, Moungi G. (2014). “Improved performance and stability in quantum dot solar cells through band alignment engineering”. Nature Materials13 (8): 796–801. Shockley, William; Queisser, Hans J. (1961). “Detailed Balance Limit of Efficiency of p-n Junction Solar Cells”. Journal of Applied Physics32 (3): 510. Brown, A; Green, M (2002). “Detailed balance limit for the series constrained two terminal tandem solar cell”. Physica E14: 96–100.Bibcode:..14…96B. SPIE Europe Ltd. “Spire pushes solar cell record to 42.3%”. Optics.org. Retrieved 2014-06-22. Baskoutas, Sotirios; Terzis, Andreas F. (2006). “Size-dependent band gap of colloidal quantum dots”. Journal of Applied Physics99: 013708..
Mitchell, Marit (2014-06-09). “New nanoparticles bring cheaper, lighter solar cells outdoors”. Rdmag.com. Barnham, K. W. J.; Duggan, G. (1990). 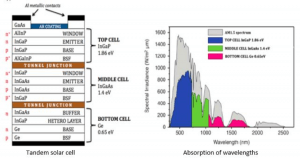 “A new approach to high-efficiency multi-band-gap solar cells”. Journal of Applied Physics67 (7): 3490. O’Regan and M. Gratzel, (1991). “A low-cost, high efficiency solar cell based on dye-sensitized colloidal TiO2films”. Nature 353 (353): 737–740..
Ellingson, Randy J.; Beard, Matthew C.; Johnson, Justin C.; Yu, Pingrong; Micic, Olga I.; Nozik, Arthur J.; Shabaev, Andrew; Efros, Alexander L. (2005). “Highly Efficient Multiple Exciton Generation in Colloidal PbSe and PbS Quantum Dots”(PDF). Nano Letters 5 (5): 865–71. .
Borghino, Dario (2014-06-10). “Quantum dot breakthrough could lead to cheap spray-on solar cells”. Gizmag.com. Jeffrey, Colin (May 27, 2014). “New record efficiency for quantum-dot photovoltaics”. Gizmag.com. Retrieved 2014-06-22. Sonwalkar N (2017),” Spectral Response of c-Si Solar Cells: Efficiency and Power Generation,” Presented at Energy Summit, Northeastern University, Boston ASME proceedings. Dr. Sonwalkar has worked with and served on the advisory committees of Naval Postgraduate College, Monterey, NASA Langley, and the US Department of Defense ADL Co-Lab, VA. He is a trustee of the Boston Digital Bridge Foundation. Dr. Sonwalkar is also regarded as a leading expert in the application of computers in education. He has extensive experience in the development of adaptive learning systems, hypermedia and advanced scientific visualization, and educational computer simulation. He is the author of hundreds of articles, research papers, and books, and has delivered keynote addresses and speeches at conferences around the world.